A four-week-old baby almost suffocated after being smuggled in a sports bag across the Morocco-Spanish border. Two women have now been arrested after the baby was discovered in the bag that had been stuffed with loaves of bread. 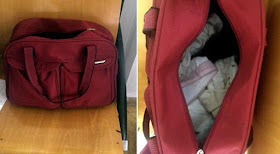 The baby vomited over an officer when it was lifted out the bag which had been sealed by a zip in the humid conditions. One of the woman, aged 27, lives in Morocco and is thought to be the child's mother. However an investigation has not ruled out the possibility the baby had been stolen. The second woman, who is 31, is from Melilla, an autonomous Spanish city that sits on the northern shores of Morocco's Mediterranean coast.